In 2013, I discussed How to Locate your Ancestors at Fernwood Cemetery in Lansdowne, PA. Thanks to ancestry.com, there’s a new and improved method! Ancestry has been regularly adding records to its Pennsylvania and New Jersey Church and Town records collection. In this collection, you’ll find a variety of indexed cemetery and funeral home records (mostly from old ledgers). Although there is no way to search all of Fernwood’s records in one fell swoop, the research process isn’t that hard. First, determine when the individual died using ancestry’s Philadelphia Death Certificates or Pennsylvania Death Certificates (for a wider range of dates and locations). You’ll find both in the card catalog by searching for “Pennsylvania Death”. The death records will confirm death date and – most likely – cemetery. Then, use the card catalog again to bring up the Pennsylvania and New Jersey Church and Town Records. On the search screen, enter “Yeadon, Delaware County, Pennsylvania” as the death location, enter at least the death year, and the first and last name. Limiting the location to exact will generally bring up only Fernwood cemetery records. If you don’t get a hit right away, try different name variations, phonetic searches, etc. Once you’ve got a hit on the right person, view the record. It will likely be a scan of a ledger page with many names on it. Find the person you’re looking for and you’ll find the section and lot numbers on the right side of the screen. 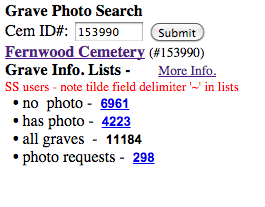 I recently exported the 380+ photo requests for Fernwood Cemetery in Lansdowne, PA and exported them to an Excel spreadsheet so that I could edit and manipulate the data. My goal was to lookup and enter section and lot information for the requests and then sort the spreadsheet to group the requests by section. There are two tools I came across to assist with this. Both require entering the cemetery ID number, found at the tail end of the cemetery page on Findagrave.com. For instance, Fernwood Cemetery’s url is http://www.findagrave.com/cgi-bin/fg.cgi?page=cr&GRid=128518735&CRid=153990 and the ID # is 153990. The first site spits out the photo request data that you can copy and paste into excel. Selecting one of the blue numbers for no photo, has photo, or photo requests gives you data that you can copy and paste to excel. Selecting “More Info” brings you to a page with more data about the cemetery’s findagrave statistics and gives you a way to search for a particular name—as well as the very handy date range search (in case you don’t know the name or the name might be misspelled).